Its long been a pet peeve, or at least consternation, that neighboring councils don’t even know what each other does and now it is reality—assuming Surge/FIA (Faith in Action) Reports are flowing. For the last several months FIA reports have been recorded on maineknights.org in the Faith in Action Blog. For all to view! As we have begun combining functions and moving more things into the digital space in efforts to leverage technology, reduce budgets, and ‘reach people where they are’, in a 21st-century culture; and as we once again collect information for the annual State Wide Directory, one thing has become increasingly apparent. Whether it be a traditional phone directory, or a directory of digital (e-mail) connections, the ever constant eb and flow of manpower presents a daunting task of keeping folks informed and connected with the right people. Likewise, the person generally works within a space that they have, over time, become comfortable. Further, the ability or willingness to change or adapt from that space varies. Thus prescribing more methods becomes both an obstacle to progress and recruitment. In an effort to meet in the middle and create some continuity we’ve employed the use of email forwarders in a standard manner. You might recognize both a pattern to the emails and a resemblance to the Supreme organization of email addresses. Have you ever been to a meeting and been asked how to contact someone via email and not had that information? Well, a standard and intuitive platform by which to presume or speculate can help. And, as manpower moves around, it becomes a much smaller task and the responsibility of leadership, to make those connection changes when they occur. So what is a forwarder? It is simply an email address that forwards mail to the right person, so they can receive and respond in an environment/workspace they are familiar or comfortable with. When you receive email from them, you may then have their more direct emailing address. See the list to the right for a full list of the current addresses. Although we have increased availability of information with the growing use of our Surge/Faith in Action Electronic Report form and reporting, it still remains a daunting task to get that information in the public view. What is more, even those that chant the same mantra on reporting still have difficulties reporting even events within the local. The Knights of Maine are on the ground performing these deeds and each individually has a unique perspective to share. Each of us has the potential to join a journalistic army to get the word out in the public view. All that is needed is the sharing of information. 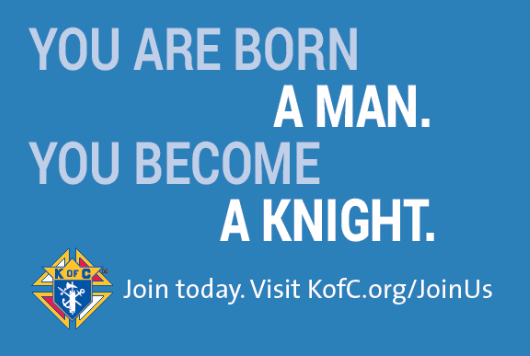 A majority of Knights has themselves, or a significant other, or a brother Knight with mobile devices capable of snapping photos and sharing information. The email publicity@maineknights.org should never be far from the fingertips. Just a few moments, really little different from sharing on Facebook, Twitter, or what-have-you, is all it takes to be part of the solution. Event notices and requests for wider advertisement for your events should still come to publicity@maineknights.org for addition to the Maine State Calendar. More capabilities are being looked into to get these notices far and wide, as well as to bring important reminders to your inbox. It was a challenge to keep up with changes in the Faith in Action program in it’s most basic form. At the turn of the program year Now to wrap heads around the full program to make enhancements to our online FIA reporting to best strike a balance between the program needs and our local council needs. Also, some reporting dates differ between the real program year for Supreme, and the needs of the Maine State Council for Convention reporting. Creating reports to suit both needs is generally formulated and will be implemented with the FIA reporting changes. Timing was not right last program year but being at the beginning of a new program year, there is hope to work with event coordinators to move much of the evil tree P’s into the digital realm. That means hopefully online Convention registration. Expanding static information. One might notice some ostensibly vacant pages on the web site. These are parking pages awaiting information from program directors to enhance our availability of information. As time permits, or the challenge is taken up, these pages will be filled with information on these programs—and more can be added on request.